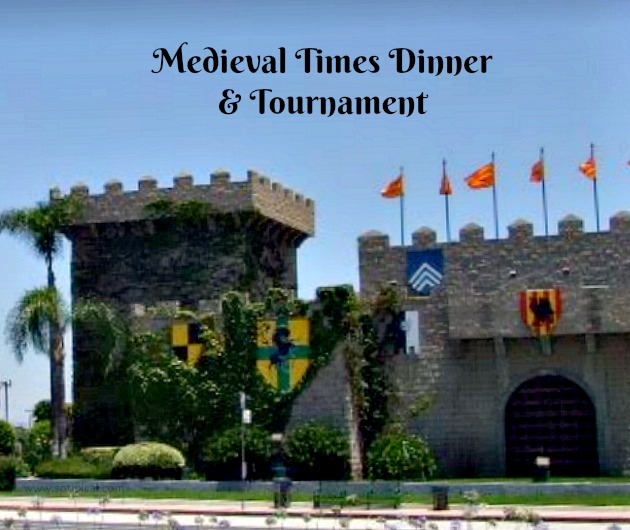 Our family had been talking about visiting Medieval Times Dinner & Tournament in Buena Park, Ca. for awhile and recently had the opportunity to make it happen! We hadn’t been there before and though we had some idea what it would be like, we soon found out that it really was so much more! Medieval Times Dinner & Tournament is now offering a great discount! Adults $36.95 and children (12 and under) $29.95 with the Discount Code MT3629 through 2/28/17. It is the perfect time to plan your visit to the castle near you! When you arrive, you will pick up your tickets (if you don’t already have them), then you will have a chance to take some photos before you enter. 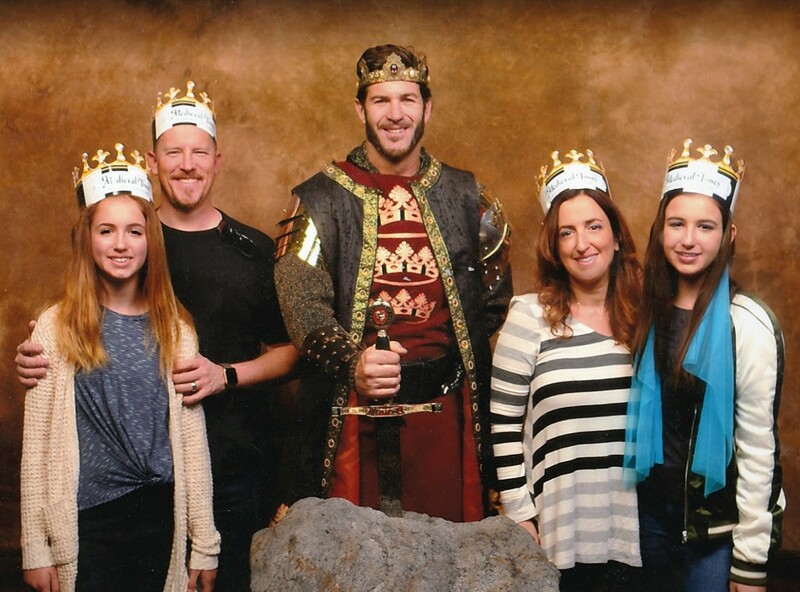 You could select different backgrounds in front of a green screen, but we opted to take a photo with the King instead! Next you will be given your assigned table and “color”. Your color indicates which Knight’s team you are on and who you will be cheering for. We had Black & White. 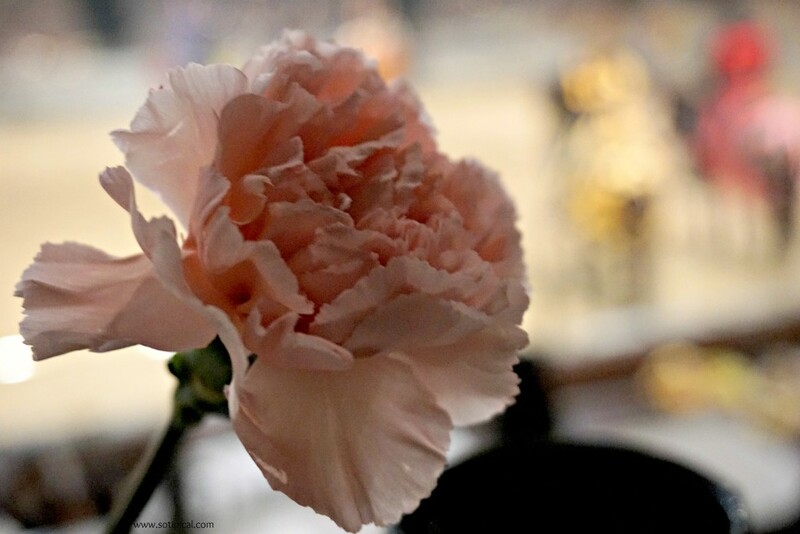 Before the doors to the arena open, you have the chance to visit the gift stands, order a beverage and/or view some of the horses. 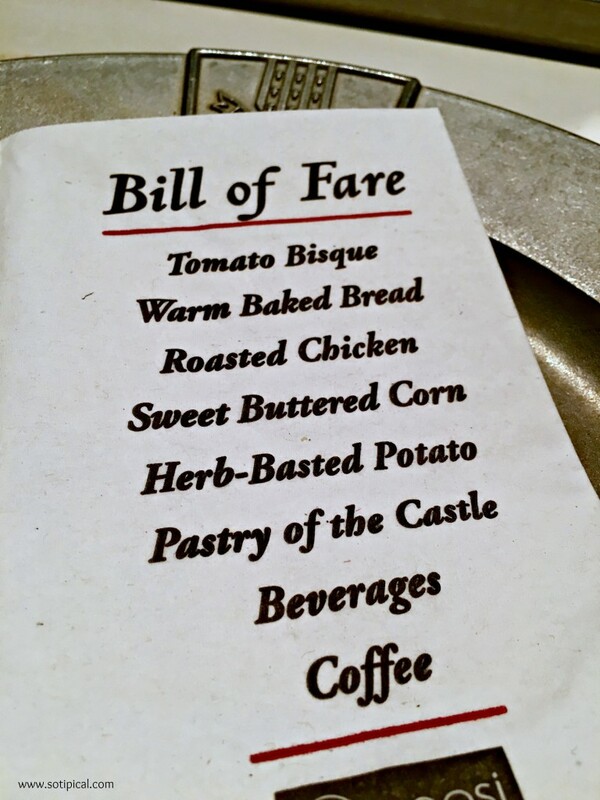 Once seated, you will meet your server, view the “Bill of Fare” (menu) and wait for the fun to begin! 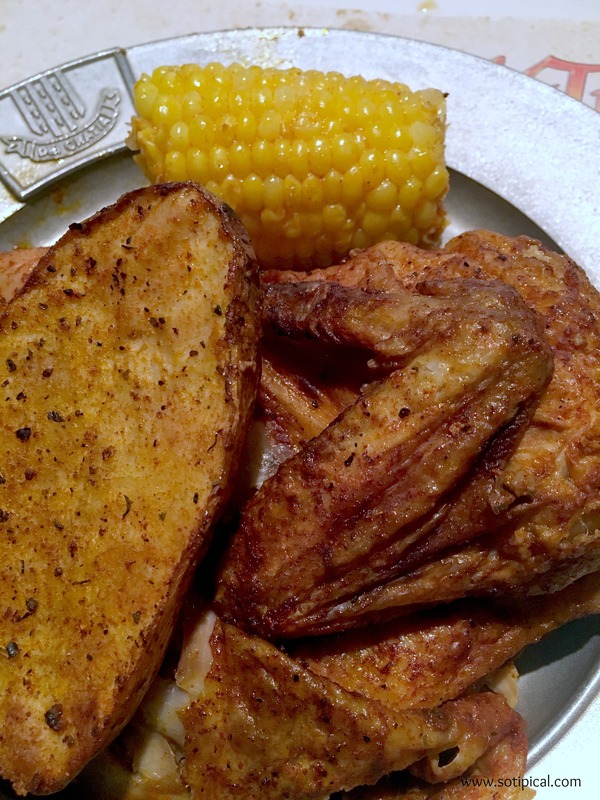 Something we didn’t know is that there are no utensils used in this meal! Everything served can be eaten with your hands! I was skeptical at first, but it was really fun! Dinner is Served! We also had warm bread and a big slice of lemon pound cake for dessert! While we ate, the festivities began! This was our host for the evening. He opened the show and was somewhat of a narrator. 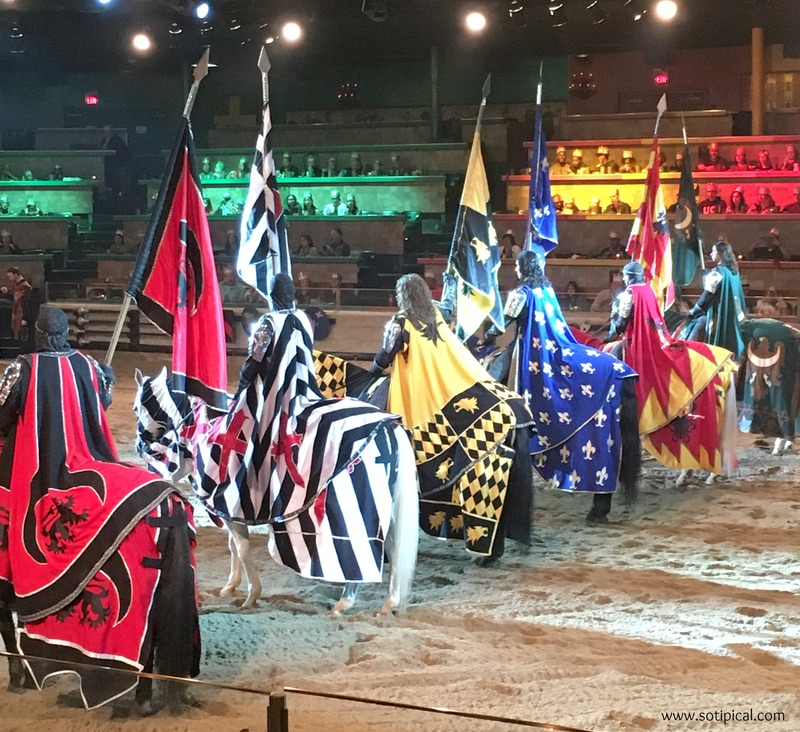 All Knights begin their training as Squires – just as they did in the Middle Ages – learning horse care, sword fighting, and weaponry. It takes a minimum of six months of training to become a Knight. 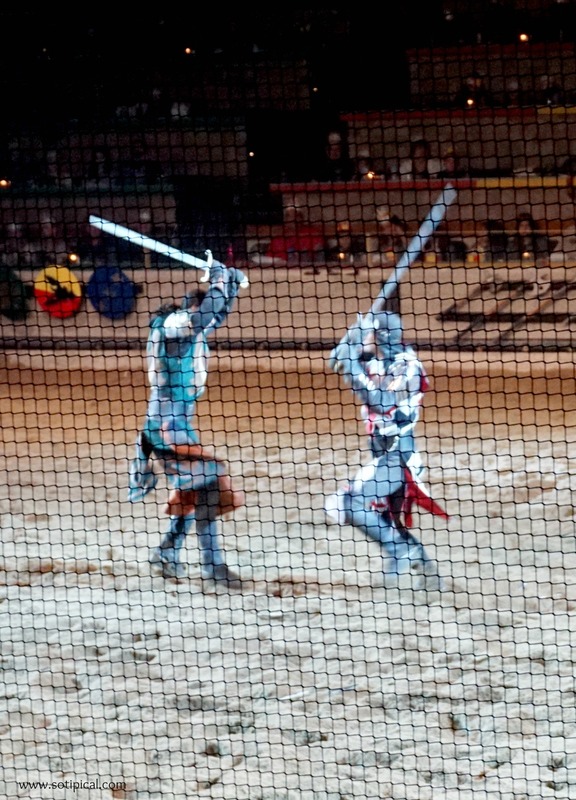 Knights perform with real metal weapons and wear authentic armor. During battle scenes, real titanium swords create sparks. Every shield must be repainted after every show. 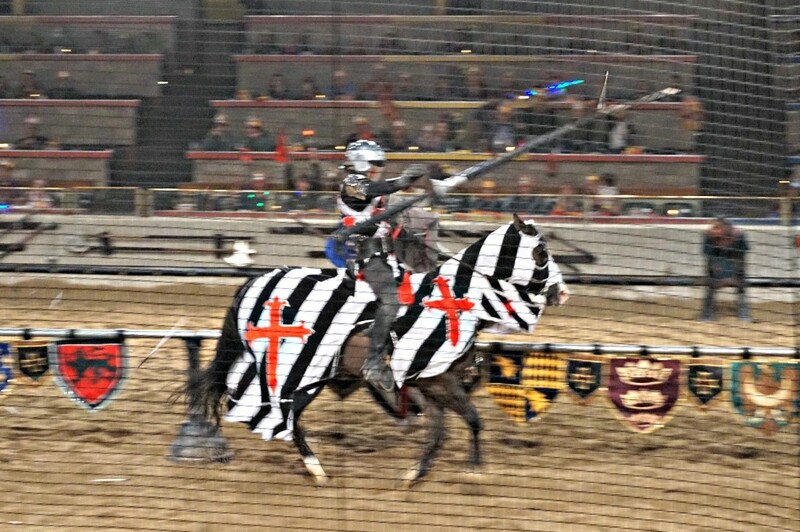 When jousting, the Knights charge at speeds of approximately 15 to 20 miles per hour and reach an impact velocity speed of about 30 to 40 miles per hour. Each year, 25 foals are born at Chapel Creek Ranch, where they spend two years training. 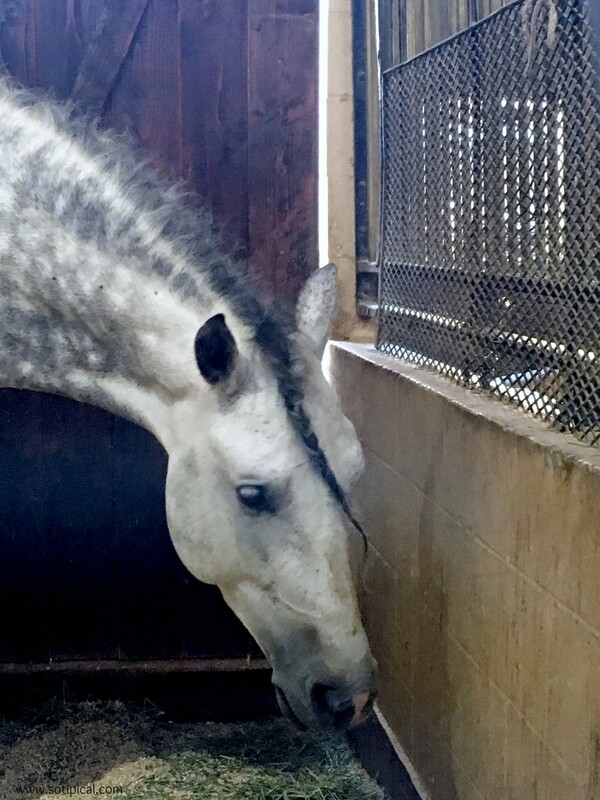 Our horses enjoy retirement at the ranch after 15 to 20 years of performing. 125,000 gallons of soup are served each year. 400,000 gallons of Pepsi are consumed each year. Each arena is filled with about 4,455 cubic feet of sand – about the load of 10 dump trucks. 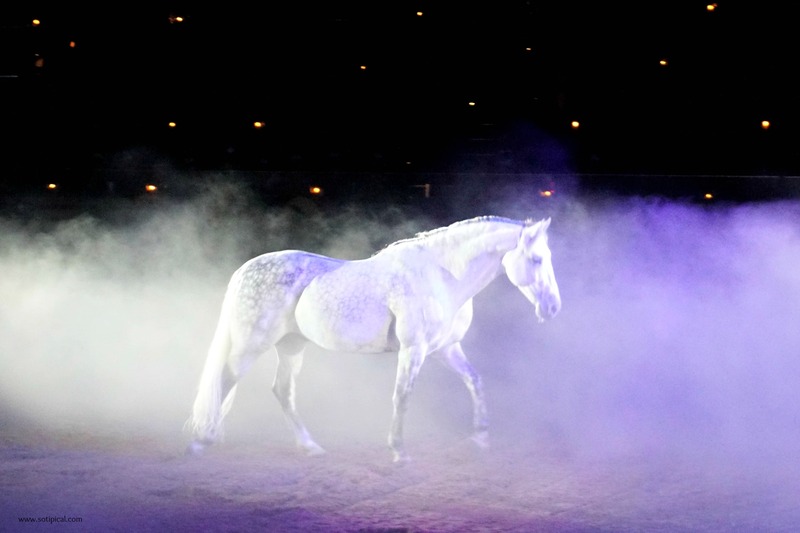 Medieval Times is the #1 breeder of pure Spanish horses in North America. I wish I could have captured all of the SPARKS during the sword fight! A gift from our Black & White Knight! It was a fun evening and we’re so glad we went! The food was good and the show was great! Everything moved right along and there were no dull moments. The servers were friendly, helpful and did an amazing job! I would highly recommend visiting with your family and friends! Its also a fun place to celebrate a special occasion. There were birthdays, anniversaries and there was even one couple on their honeymoon! All were acknowledged and cheered on by the audience members. Take advantage of the great discount being offered now, through February 28, 2017! 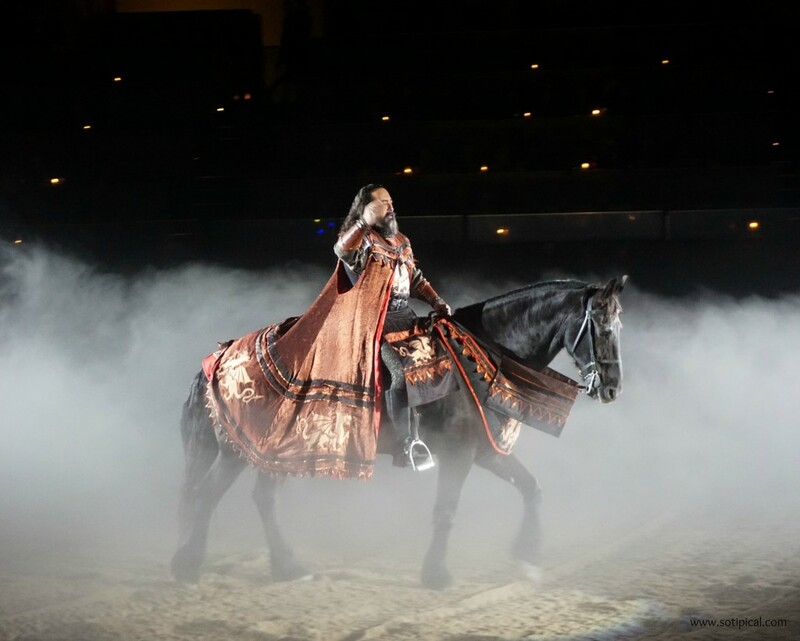 My readers save at Medieval Times Dinner & Tournament! Use this exclusive promo code MT3629 through 2/28/17 and receive Adults for just $36.95 and children (12 and under) only $29.95, with locations in Atlanta, GA, Baltimore, MD, Buena Park, CA, Chicago, IL, Dallas, TX, Lyndhurst, NJ, Myrtle Beach, SC, Orlando, FL and Toronto, ON. Get your tickets now! *Disclosure: I received complimentary tickets to this event through US Family Guide in exchange for my review. All opinions expressed are 100% my own.